ARLINGTON, Texas – Lead by a flawless Eduardo Aparecido (Gouvelandia, Brazil), Team Brazil went 7-for-9 on the first night of the 2019 WinStar World Casino and Resort PBR Global Cup USA, presented by Monster Energy, to surge to a 245.25-point lead over the home nation’s Team USA-Eagles. Previously victorious at a PBR (Professional Bull Riders) event inside AT&T Stadium, winning the 2017 Iron Cowboy, Aparecido recorded his first qualified ride in the opening round when he rode Constant Sorrow (Blake Sharp/Machinery Auctioneers) for 82 points. Selected by Coach and 2010 PBR World Champion Renato Nunes (Buritama, Brazil) to compete in the bonus round, Aparecido remained flawless when he rode Uncle Gangster (Ogden Ranch/Hart Cattle/Clapp) for 88.5 points. 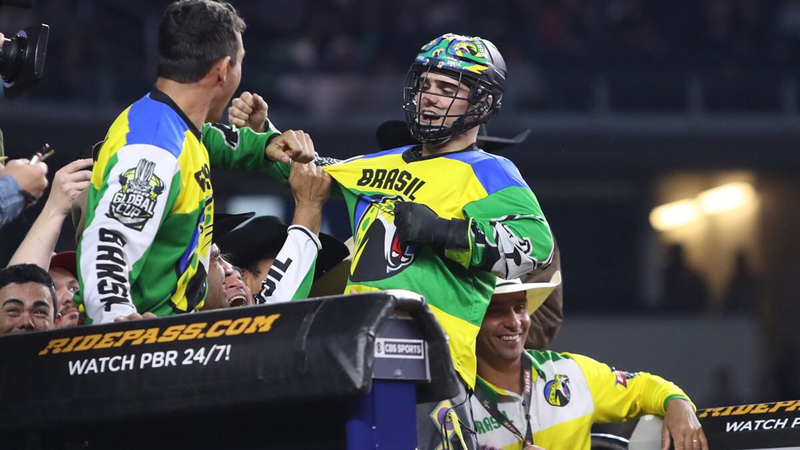 Jose Vitor Leme (Ribas do Rio Pardo, Brazil) made history on the opening night of the inaugural PBR Global Cup USA, recording the first-ever 90-point ride at the Olympics of bull riding. Achieving the milestone in the bonus round, Leme rode Frequent Flyer (D&H Cattle/Erwin Cattle) for 90 points. Competing at his first PBR event outside of Brazil, Bruno Scaranello (General Salgado, Brazil) scored the South American nation’s first qualified ride, marked 87.5 points on Swamp Wreck (BS Cattle Co./Ace of Spades/Red Laces Cattle Co.). As the next Team Brazil rider to compete in the event’s opening round, 2018 PBR World Finals event winner Marco Eguchi (Poa, Brazil) delivered the nation’s second 8-second effort, scoring 79 points for his trip aboard Stars & Stripes (Dakota Rodeo/Chad Berger/Clay Struve/Connie Pagels). Next to erupt from the chutes for Team Brazil was 2018 PBR World Champion Kaique Pacheco (Itatiba, Brazil) who had yet to compete in 2019 since tearing his left MCL/PCL in November at the Velocity Tour Finals. With the crowd inside AT&T Stadium eagerly awaiting his return, the Ice Man brought them to their feet when he rode Taco Cat (Dakota Rodeo/Chad Berger/Clay Struve/WCM Auctioneers) for 83.5 points. Fernando Henrique Novais (Pereira Barreto, Brazil), who qualified to the team via the PBR Brazil national standings, struck next when he rode Uncle Keith (Phenom Genetics/Bills/Sankey Pro Rodeo) for 85 points. Second after the first night is Team USA-Eagles, who went 4-for-9 to amass 350.25 points. The home nation contingent was led by 2016 PBR World Champion Cooper Davis (Buna, Texas), who is going 2-for-2 and currently leads the individual aggregate. Davis first reached the 8 on Arctic Assassin (Phenom/JCL/Swalin/Goods Bucking Bulls/Sankey Pro Rodeo) in Round 1 for 85.75 points, which he followed with on 89.5-point ride on Hard & Fast (Glover Cattle/D&H Cattle) in the bonus round. Cody Teel (Kountze, Texas) recorded the high-marked ride of Round 1, scored 89 points on Stunt Man Ray (Broken Arrow Bucking Bulls). Brennon Eldred (Sulphur, Oklahoma) was the final rider for the home nation contingent to reach the 8-second mark, covering Big City (Plummer/Hart Cattle Co.) for 86 points. Just 5.5 points behind Team USA-Eagles, and 250.75 points behind event leaders Team Brazil, Team USA-Wolves sits third after the first night. The historic all Native American Team went 4-for-9, led by Cody Jesus (Window Rock, Arizona; Navajo) and Cannon Cravens (Porum Oklahoma; Cherokee) who each earned an 87-point ride in the first round, covering Kern River (Hart Cattle Company) and M.A.G.A. (TNT Bucking Bulls/Hart Cattle Co.), respectively. Also putting up scores for the contingent were Ryan Dirteater (Hulbert, Oklahoma; Cherokee) and Stetson Lawrence (Williston, North Dakota; Chippewa and Sioux). Dirteater was marked 85.75 points on Boogie Bomb (Bland Bucking Bulls), while Lawrence made the 8 on ZZ Top (Blake Sharp) for 85 points. In fourth is Team Mexico who went 2-for-9 to finish the first night 425 points behind Team Brazil. The nation’s scores were earned by Alvaro Aguilar Alvarez, 85.75 points on Harold’s Genuine Risk (M Rafter E Bucking Bulls), and Jorge Valdiviezo, 84.75 points on Throw Down (Bland Bucking Bulls). After hosting the last edition of the PBR Global Cup, Team Australia is fifth, going 2-for-9 for 169.5 points. Reigning PBR Australia Champion Aaron Kleier (Clermont, Queensland) recorded the country’s first qualified ride, covering Ol’ Boy (Dakota Rodeo-Chad Berger/Clay Struve/Ken Barnhard) for 82.75 points. Lachlan Richardson (Gresford, New South Wales) put up Australia’s second score, going 8 on Medicine Man (TNT Bucking Bulls/Hart Cattle Co.) for 86.75 points. In sixth is Team Canada. The nation’s lone qualified ride was earned by Jordan Hansen (Okotoks, Alberta) who rode Bottoms Up (TNT Bucking Bulls/Hart Cattle Co.) for 87 points in the bonus round. The 2019 WinStar World Casino and Resort PBR Global Cup USA, presented by Monster Energy, concludes on Sunday, February 10 at 12:45 p.m. CST inside AT&T Stadium in Arlington, Texas. Fans can relive all the action from the event’s first night starting at 8:00 a.m. EST tomorrow, Sunday, February 10, on RidePass.